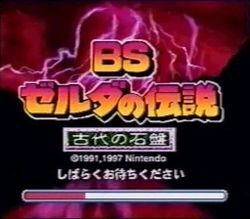 BS The Legend of Zelda: Inishie no Sekiban (BSゼルダの伝説 古代の石盤 , BS Zelda no Densetsu: Inishie no Sekiban?) is like a "second quest" (ala The Legend of Zelda) for Nintendo's famous The Legend of Zelda: A Link to the Past. It was only available via download for the Satellaview, a Japan-only add-on for the Super Famicom. It has the same basic overworld of A Link to the Past but it is far more than simply a Master Quest, as there are now rental shops and timed events, as well as altered interiors for all locations (not just dungeons). This page was last edited on 10 February 2016, at 03:44.